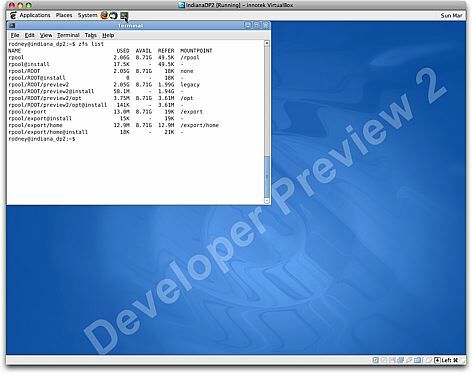 I’d not heard of VirtualBox until I attended the Sun Tech Days Australia Developer Conference earlier this week. 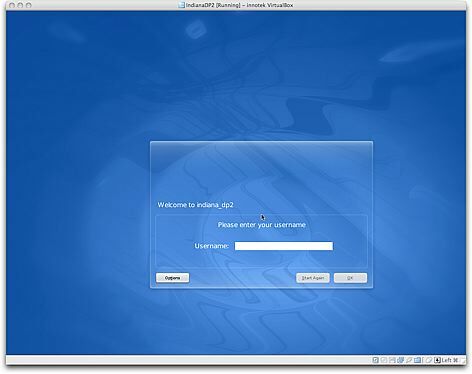 Since it could run on OpenSolaris (and OS X), I thought I’d give it a try and test both VirtualBox AND the latest release of the OpenSolaris Developer Preview 2 (Indiana). 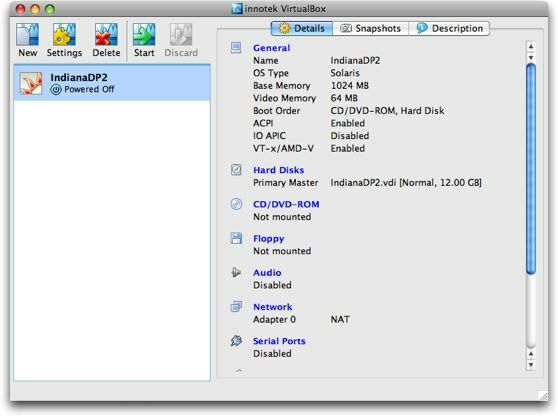 VirtualBox installs (from the very sleek 21MB download) like any normal Mac OS X application on my MacBook Pro running OS X 10.5.2 (Leopard) and the application is extremely easy to use (much like VMware and Parallels). When creating my New Virtual Machine I tinkered with the default settings (giving myself 1024MB of RAM (up from the default of 128MB), a 12GB expanding disk (up from 8GB) and upgrading the video memory from 8MB to 64MB for the virtual machine). Started up the virtual machine with the OpenSolaris Developer Preview Live CD and shortly OpenSolaris is running. You can then double click the “Install OpenSolaris” icon and follow the wizard and in 15 minutes you’re installed and up and running. Some Google searching and I’ve discovered that Alan Burlison had already looked at this, so I grabbed his xorg.conf file. To get the Indiana screen resolution up to 1280×1024 – for me on OS X all I needed to do was put the tweaked xorg.conf into /etc/X11 and restart the X server (log out and back in). I’ve also tried further tinkering with this to get resolutions like 1152×864 (which does work); 1440×900 and 1680×1050 working but with little success so far – if anyone knows how to get these (later two) working with OpenSolaris under VirtualBox (on OS X or OpenSolaris) I’d be happy to hear about it. To make all these files accessible to your VM, they need to be made into an ISO image that you can mount in the VM, using Devices -> Mount CD/DVD-ROM -> CD/DVD-ROM Image… To make this a little easier I’ve prebuilt an ISO of the drivers and xorg.conf files which you can download from here. One very cool thing with this new Indiana Developer Preview of OpenSolaris is that by default the root filesystem is using ZFS – as you can see from the output of zfs list in the screenshot below. Thank you for posting this. Extremely helpful. I’m new to OpenSolaris and can’t seem to find a straight answer so I’m asking here: what do you do after installing the nic driver(s)? ifconfig -a only has lo0. How would I load the driver or bring up the interface? and it’s inserted under the VertRefresh in your Monitor section. See if that gives you any luck. Excellent artcle, thanks for the drivers made life really easy. Wow, thanks for the drivers!! Great post, and thanks for all the drivers!